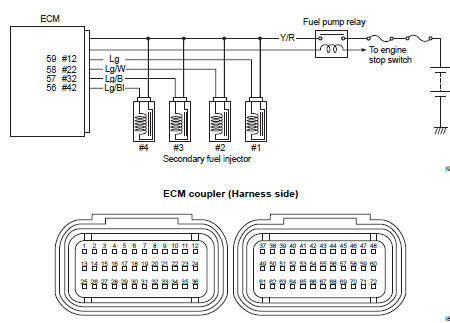 Some failure exists in the fuel injector signal in a high load, high revolution condition. 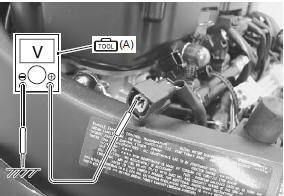 Check the secondary fuel injector coupler (1) for loose or poor contacts. 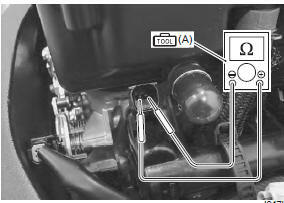 Lg wire open or shorted to ground, or poor “59” connection (#1 cylinder side). Lg/w wire open or shorted to ground, or poor “58” connection (#2 cylinder side). Lg/b wire open or shorted to ground, or poor “57” connection (#3 cylinder side). 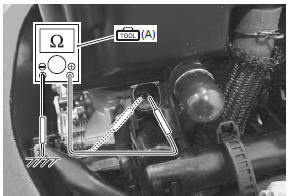 Lg/bl wire open or shorted to ground, or poor “56” connection (#4 cylinder side).